1) Who won the race? 2) What order did the team come in? 3) Show how you worked it out. Is homework a good idea? A BBC Newsround report today questions whether homework is a good idea (http://www.bbc.co.uk/newsround/38383428 ). I would argue that it depends on what the homework task is. Giles Hughes, a teacher in Birmingham, was so fed up with hearing children’s excuses such as homework being left on the bus or eaten by the dog, that he decided to do something about it. He asked his pupils to list things that they were interested in outside of school and their favourite school lessons. Football, art, science fiction, dinosaurs, sport, computer games and crafts all figured highly on their lists. He then set about creating homework tasks that would appeal direct to the pupils. 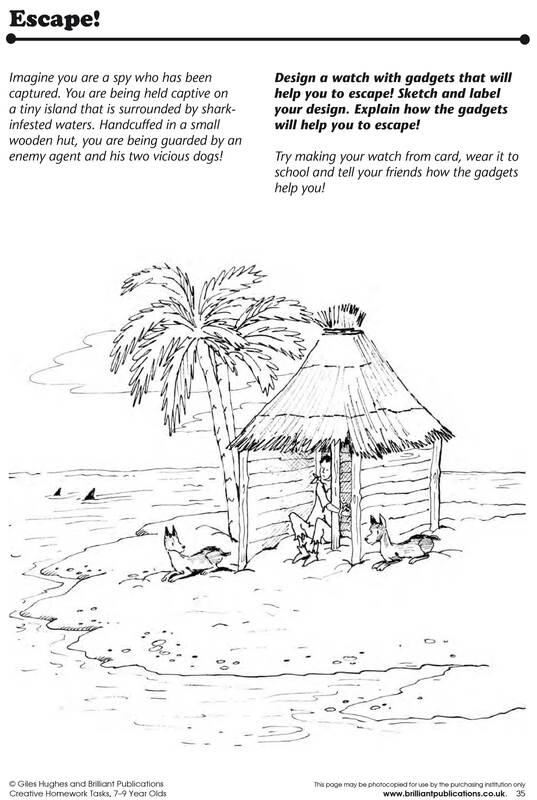 The first creative homework task he came up with was one where pupils had to invent their own ‘James Bond’ style watch. The watch design had to incorporate three gadgets which their ‘hero’ could use to defeat or escape from an enemy. Giles knew that children love secrets and an element of mystery so, in order to attract their interest, he staged this first task. On Monday morning he sat with his back to the class working at his desk before calling the register, apparently engrossed in what he was doing. Within moments he was surrounded by a group of inquisitive children eager to see what he was up to. He quickly covered the work, giving just enough time for pupils to see that he had been drawing something. Despite constant pestering he refused to tell them what he had been sketching. He continued this charade through the week, making sure that news and occasional glimpses of his ‘Design a Gadget Watch’ homework sheet slowly filtered around the class. The sheet was highly visual, keeping text down to a minimum. On Friday he introduced the task to the children proudly, showing his watch design and explaining its functions. To his amazement two of the boys called called out, ‘we’ve done ours already; we sneaked in at playtime and saw it on your desk!’ These two individuals, who hadn’t managed a single piece of homework between them all year, now produced finished watch designs and stories from their bags! That week every child in the class completed their homework on time and Giles realised that he was on to a winner. Over the next year the number of children participating in homework rose as they worked their way through the new creative tasks that Giles devised. Pupils’ literacy and numeracy skills improved. Furthermore, feedback from parents was extremely positive, many noticing a positive change in their children’s attitude towards homework. 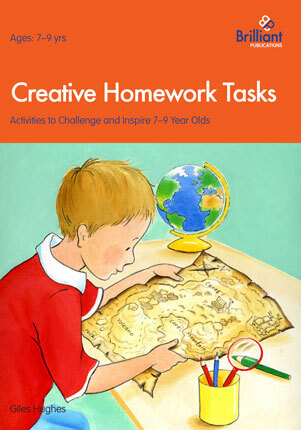 The good news for you is that Giles has published his creative homework tasks in a two-book series so you can experience the same success with your class. 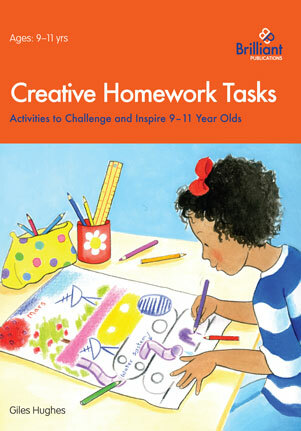 Sample tasks from both Creative Homework Tasks for 7-9 Year Olds and Creative Homework Tasks for 9-11 Year Olds are available on the Brilliant Publications website, so you can try them for yourself! All the tasks in the books have been trialled in a number of schools and are the culmination of many months of research, feedback and editing. They have been designed so that they can be given out with little or no input from the teacher if need be although – in Giles’ experience – a little enthusiasm from the teacher goes a long way. There are even teacher’s notes for each task, giving examples of extension activities, relevant websites, fun ways of accessing the tasks and solutions to the problems! A new initiative in the Republic of Ireland called Super Troopers aims to increase fitness levels in the more than 60,000 children taking part by giving them PE activities for homework.